Description This is a template for a relationship map. 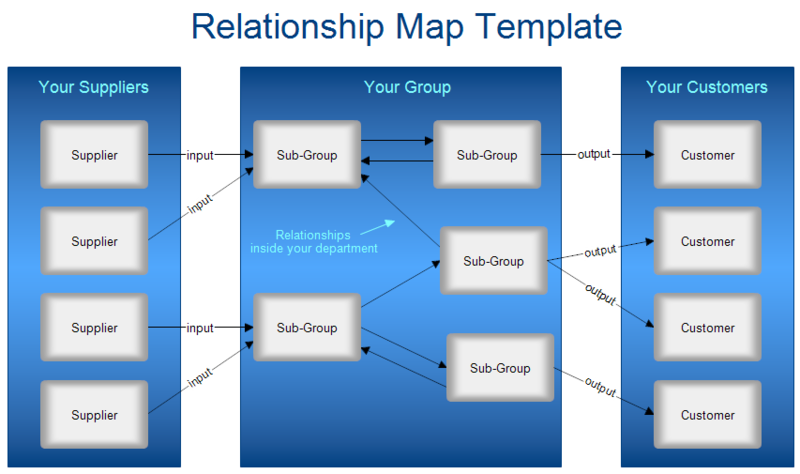 Relationship maps are part of Processing Mapping. To download and modify this relationship diagram, see the Drawing Instructions below. Relationship maps are high level diagrams as opposed to cross-functional maps or flowcharts which show more detail. A relationship map is made up of three boxes shown in blue above. Your Group. Your group is represented by a rectangle in the middle of the chart. It can be a company, division, section, department, or whatever. Suppliers. On the left you draw a rectangle representing your suppliers. Each supplier has a box. Since this is a template, the boxes have the word "supplier," but you will fill in the names of your suppliers. The lines coming from the suppliers show what they supply. The lines in the template show the word "input" and you will replace that word with the actual commodity. If the supplier supplies pencils, then you will replace input with pencils. Customers. On the right is a box that shows your customers. You would fill each box with the actual name of a customer. The lines from your group box to the customers show what you supply them. So you will replace the word "output" with the actual output. If your group is internal to a corporation, your customers may be other departments in the corporation. Don't confuse the corporate customers with your customers. Sub-Groups. If your group is large, it may have several sub-groups which may have inputs and outputs between the other sub-groups. This is all shown within the central group rectangle. The inputs and outputs may be physical items or documents. If you have a lot of sub-groups, the map will get messy so you may want to draw a relationship map for each subgroup, making it the central group. To draw a relationship map, you need to know who your suppliers are and what they supply you. You need to know who your customers are and what you supply them. Once RFFlow is installed, you can open the above chart in RFFlow by clicking on relationship-map-template.flo. To edit the text of a box or line, you can either double-click or right-click and choose "Edit Text" from the menu that appears. For example, you can double-click on each box in the blue Suppliers rectangle and fill in the name of a supplier. Then double-click on each line and replace the word "input" with the actual input from that supplier. Do this same thing for the customer boxes and the output lines. If there are any sub-groups in your company, double-click the sub-group boxes and type in the actual name. You can double-click on each line connecting the sub-groups and add the input or output.